Australia's first party representing Muslims intends to contest senate seats at the next federal election. Launching the party in Sydney, founder Diaa Mohamed told Fairfax he wanted a louder voice for Muslims. "There are a lot of parties out there to specifically oppose Islam and Muslims, yet Muslims don't have any official representation," he said. Australia has a number of anti-Islam parties, including one backed by Dutch MP Geert Wilders. Australia is not short of political parties. From today you can add another to the list: the Australian Muslim Party. But its chances of winning a senate seat are slim. Even in the parliamentary constituency with the highest proportion of Muslims, just over 20% of people follow the Islamic faith. "Anyone can set up a political party," ABC's political analyst Antony Green told me. 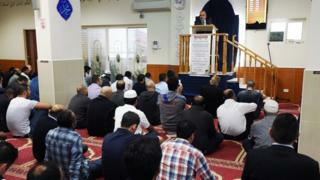 "It doesn't mean you're going to get elected and it's far from clear how much community support he (Mr Mohammed) has." Mr Mohamed, a 34-year-old businessman, also defended launching the party immediately after terror attacks in Paris this week. "There are going to be a lot of questions raised in the coming days of the events recently, and this is the whole reason we created this party," he told the ABC's AM program. "So it is as good a time as any to launch it." Mr Mohamed condemned the attacks in Paris and said Islam strictly forbade the killing of innocent people. But he said his party would never support the invasion of a Muslim country in response to an incident such as the attacks in Paris. "Let's look at how well that's worked in the past. We've invaded Afghanistan … we've invaded Iraq, and we're in the mess we're in right now," he said. "So would I support something that's never worked in the past? No."